Lacquer wares represent the epitome of handicraft and originate from China and Japan, but centuries ago spread slowly throughout Asia. As the material is ultimately perishable, antique lacquer wares are rare and seldom without restoration. The process is not only complicated, but also highly time consuming as thinly weaved strips of bamboo are dipped in lacquer up to 18 times and between each process left to dry. The lacquer must be evenly applied and thereafter protected from the perils of nature, hence they were often kept in caves during the drying process. 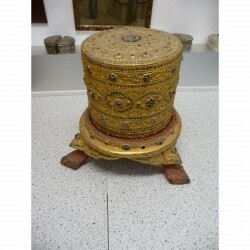 The ultimate beauty is manifested in the intricate patterns and subsequent application of striking colors which ensures a superior sheen, - yes, an antique lacquer box is truly handicraft at its best! Lacquer boxes There are 17 products. 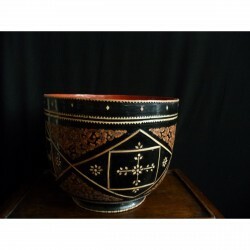 A beautiful black bowl/box. Place of origin: Burma Material: Lacquer/Wood. Height: 22 cm. Lenght/dept: Diameter: 25 cm. 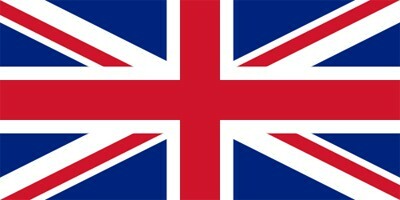 Age: 20 th cent. 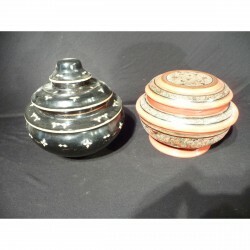 A beautiful black bowl/box. Place of origin: Burma Material: Lacquer/Wood. Height: 20 cm. Lenght/dept: Diameter: 28 cm. Age: 20 th cent. 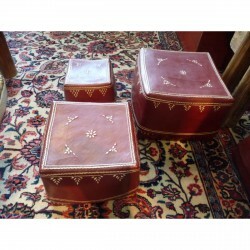 Round storageboxes. 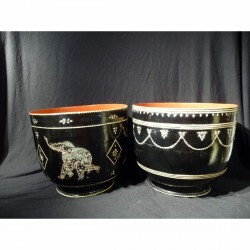 Place of origin: Burma Material: Lacquer Height: 13 cm and 18 cm. Lenght/dept: Age: 20 th cent. 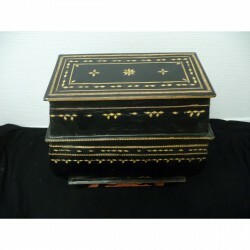 Beautiful black storage box with wooden "legs" Place of origin: Burma Material: Lacquer Height: 30 cm. Lenght/dept: 18 cm. Age: 20 th cent. 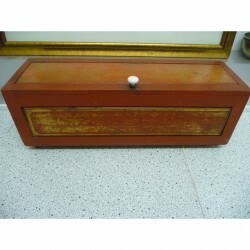 Red lacquer storage box made of bamboo and lacquer. Place of origin: Burma Material: Lacquer Height: Various. Lenght/dept: Various. Age: 20 th cent. 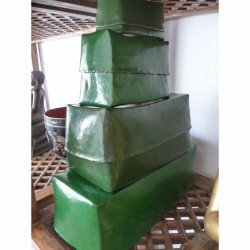 Red and green bamboo storage box with several layer of lacquer. Place of origin: Burma Material: Lacquer Height: Various. Lenght/dept: Various. Age: 20 th cent. 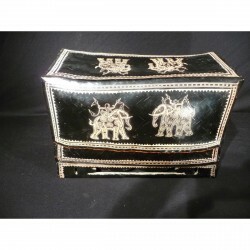 A black container in wood and lacquer, pattern and elephants. Place of origin: Burma Material: Lacquer/Wood. Height: 31 cm. Lenght/dept: Age: 20 th cent. 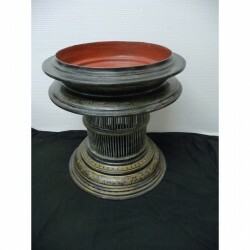 A centerpiece in black wood and lacquer. Place of origin: Burma Material: Lacquer/Wood. Height: 33 cm. Lenght/dept: Age: 20 th cent. 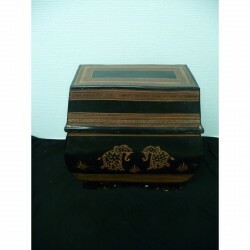 A black box in wood and lacquer with bamboo made pattern. Place of origin: Burma Material: Lacquer/Wood. Height: 30 cm. Lenght/dept: Age: 20 th cent. A red box in wood with decorated lacquerplates inserted. Place of origin: Burma Material: Lacquer/Wood. Height: 18 cm. 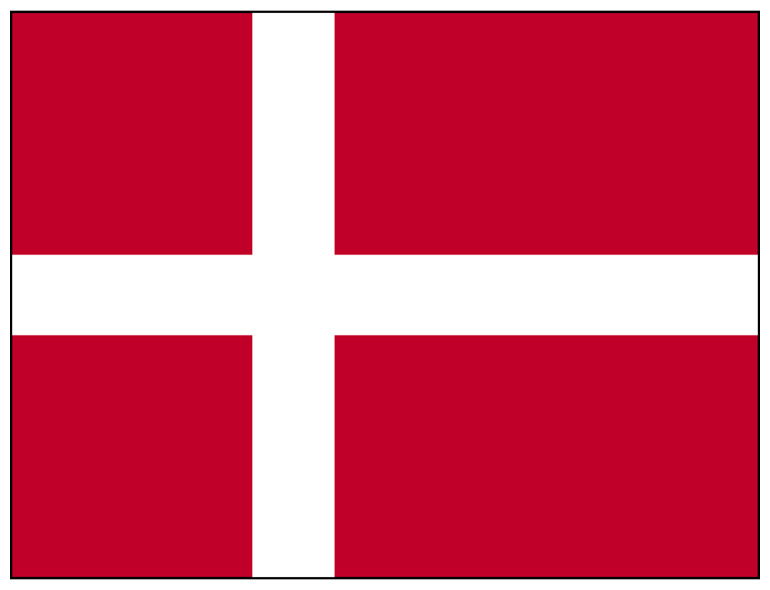 Lenght/dept: 50 cm. Age: 20 th cent. 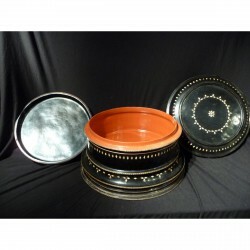 Highly decorated lacquer begging bowl with inserted stones all over. On a wooden base. Ceremonial use. Place of origin: Burma Material: Lacquer/Wood. Height: 28 cm. Lenght/dept: Age: 20 th cent.